The Carnabys at Barfly; don’t mind if I do. I tried to remember where I’d seen them before. Well, it was a while ago at Hard Rock Calling in 2013, but we hadn’t crossed paths since; time to put that right. Before the main event, Hoodoo Daze put in a good shift with a blend of psychedelia and big guitar riffs harking back to early Pink Floyd at times and a bass player who threw some serious Peter Hook shapes. Good response, but you could feel the anticipation ratcheting up as The Carnabys prepared to launch into their set. The audience at the front of the stage was buzzing even before the band finished their last minute tuning checks and launched into “Great Dane in the Graveyard”. 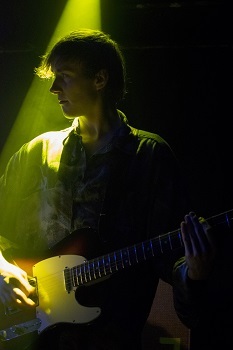 It all went a bit chicken oriental after that with a mass of bodies jumping up and down in front of the stage as the band locked in to the pulse, with drums, bass and guitars meshing perfectly at breakneck speed before Jack Mercer’s powerful vocals soared in over the wall of sound. And that’s just the first thirty seconds. The set was a mix of songs from “No Money on the Moon” (including “Breathing”, Is That My Baby”, “Come Over, Come Stay”, “SNIKS” and “Where I’d Rather Be”) and the upcoming 2016 album (including “Great Dane…”, “Elizabeth” and “Peaches and Bleach”) and the almost obligatory Bowie tribute, a rip-roaring version of “The Jean Genie”. There’s a certain retro feel to this band; you can draw a straight line back in time through The Carnabys and The Jam and to The Who. The all have the same energy, good tunes, great playing and a definite London vibe and attitude. There’s a bit of rock in and some late seventies power pop, but the mix of melodic bass lines, two guitars and some frantic, almost Moon-like, drumming creates the kind of excitement I thought had died out after Two Tone. They’ve got the tunes, the stories, the ability and the moxie; let’s see what 2016 brings. And just a word of consolation to Dana Immanuel and the Stolen Band (or three-quarters of it) who should have played before The Carnabys but were reshuffled to the late slot. They should have been playing to a full house, but lost out when the venue almost emptied after The Carnabys finished their set. Shame really, because Dana’s a great songwriter and the band was on good form. The new album from The Carnabys is scheduled for release later this year. Normally the Riot Squad wouldn’t be having much to do with sporting events, but we’re willing to make an exception in this case because of the cultural significance of this event (and its sibling the opening ceremony). This was billed as an event with a playlist which was more Heart FM than Radio 1 and that description was pretty much on the money. We got performances from British pop legends Ray Davies, Madness, Pet Shop Boys, Annie Lennox (in a piece which was a bit like a live version of a bad Duran Duran video), Queen (half of them in person, Freddie on film), Take That (with one notable exception), the Spice Girls (all of them) and The Who (well, Daltrey and Townshend). We also got a pretty varied selection of newer artists covering a pretty wide spectrum of current British popular music. How about Emeli Sandé, One Direction, Elbow, George Michael, Kaiser Chiefs, Ed Sheeran, Fatboy Slim, Jessie J, Tinie Tempah, Taio Cruz, Beady Eye and Muse? It’s not comprehensive, but it did give a pretty good snapshot of the contemporary British music scene. Any attempt to summarise British popular culture over the last fifty years in three hours is pretty much doomed to failure from the start, but this was a brave attempt. And it wasn’t just about the music; we had fashion, comedy, dance and drama as well. We also had the unsavoury spectacle of politicians trying to hijack the event for their own ends, and we really don’t need to see the Prime Minister and the Mayor of London idiot-dancing to the Spice Girls to boost their credibility with the voting public. Honestly, we’re not as stupid as you seem to think we are (and we didn’t see you strutting your stuff to the bhangra or disco material either, so not so inclusive at all really). And we had Matt Bellamy fronting Muse in his usual quiet style with keyboard and guitar virtuosity only to be trumped by Brian May with a routine which he’s been doing for the best part of 40 years (although not always with Jessie J to front it). The event ended with a Who medley (you can make up your own punchlines about growing old here) and it was all over for another four years; apart from the online feedback and some of that was pretty horrific, particularly the posts about Gary Barlow. We can all have our own opinions about the worth of someone’s work (and for what it’s worth, I think Gary Barlow’s a really gifted songwriter) but it’s never acceptable, under any circumstances, to attack a performer because they’ve suffered a personal tragedy. I’m not going to attempt to communicate my disgust to you because Jason Manford has already done that in a way that won’t be bettered. Those personal attacks left a bitter taste after a hugely celebratory event. It’s interesting to look at the Beatles influence on the opening and closing ceremonies; the opening ceremony was influenced by McCartney, while the closing ceremony was influenced by Lennon, but we didn’t hear the best work of either songwriter (apart from fleeting references to “A Day in the Life” in the closing ceremony). It seems quite fitting to bookend the London Olympic Games with those two British pop legendOn balance, the closing ceremony was a brave attempt to capture fifty years of British of British popular culture which worked most of the time and, when it didn’t, it failed heroically. And as an added bonus, most of the artists involved in the ceremony performed really well in this week’s singles charts, even those that didn’t appear personally. It seems that there are some things that we Brits are really quite good at. OK, I’m sorry that this is going to be London-centric but, at the moment, you can only see this exhibition in London at the moment and that’s just the way it is. So, my apologies to anyone who can’t actually get into central London before the end of August, but there are plenty of links to online resources to give you a flavour of this show. Gallery Different is easy to find, about halfway between Northern Line stations Tottenham Court Road and Goodge Street on Tottenham Court Road, and surrounded by loads of welcoming pubs and interesting places to eat (the Riot Squad always researches background thoroughly). 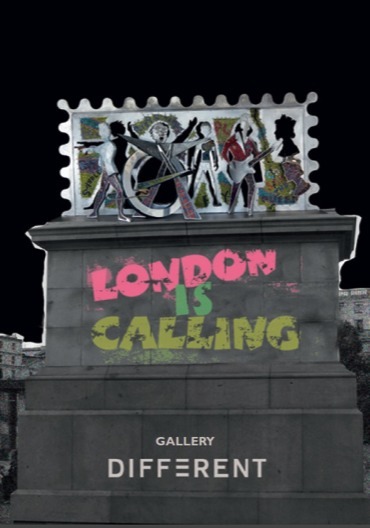 “London is Calling” is an exhibition featuring music-related artworks by sculptor Guy Portelli, painters Chris Myers and Morgan Howell, mixed media artist Keith Haynes and photographers Charles Everest, Michael Ward and Nathan Browning. If you’re interested at all in the iconography of pop and rock music, you should really make the effort to see this exhibition. The photography is all excellent, but the highlight for me is the recently-published selection of Charles Everest’s photos from the 1970 Isle of Wight festival featuring some absolutely stunning images of Miles Davis and Jimi Hendrix and many other great images of a hugely important event in British social history. Nathan Browning’s work is based on the photographic image, but with the addition of painting, ink and poetry pushing it towards multi-media territory. Moving on to 3 dimensions, Guy Portelli’s dynamic sculptures successfully capture the essence of artists such as John Lennon and The Who while avoiding the stereotyped figurative representations which are so common in collections of British cultural ephemera. Keith Haynes’ pieces are thoughtful and often ironic, constructed from original artefacts stripped down and reconstructed as creative images. The majority of the pieces are constructed from original vinyl singles and albums, with the exception of the wonderful “Acid Queen” which is made entirely from Smiley badges and is a piece which anyone interested in popular culture should make the effort to see. Chris Myers’ paintings focus on divas through the popular music era and the Amy Winehouse pieces here are sympathetic representations of a great British torch singer while Morgan Howell delivers larger than life acrylic representations of iconic seven-inch singles from Elvis to The Clash. Popular culture exhibitions in London can be very tightly-focussed affairs featuring 1 era or 1 medium but “London is Calling” covers a period of 50 years and encompasses photography, painting, sculpture and various multi-media forms. If you live in or near London (or you’re visiting), go and see this exhibition. If not, check out some of the links; you won’t be disappointed.